The Internet has been a buzz lately over our food system's hopeful transition to a more sustainable, smaller, slower way of farming. While some of us have lauded Michelle Obama's edible garden on the White House lawn as, well, a victory, others are not so happy. Indeed, a movement is gathering against the garden by none other than the chemical fertilizer and pesticide companies. Shocking! The Queen of England might have something to say about that! (via Arduous). Equally shocking is the latest news on grassfed beef. Think you are doing your part by switching to happy meat? Well, the animals are certainly better treated but is their impact on the planet less than the unhappy souls corralled in a feedlot? Do they emit less methane? I found out the answer through Grist, via The Conscious Shopper. You might be rethink your dinner. Perhaps, the soy burger would be a better choice - unless it is from Silk/White Wave which recently started using more and more conventional soy, grown in China, in their formerly "organic" products. Would you like some GMOs with that? Speaking of GMOs, any one been privy to Monsanto's purported plans to save the world - or at least the starving children of Africa - broadcast on NPR and similar media outlets. Grist investigates the truth behind the GM seed giant's claims. Of course, food is not the only thing you can make from scratch. Melinda over at 1 Green Generation gives shares her recipe for DIY potting soil. Hmm, never thought of that but it would save a lot of peat moss and eliminate a lot of plastic bags. And those plastic bags . . . Are you still not bringing your own to the store? Kathryn at Plant Whatever Brings You Joy gives a colorful and thorough round up on the available "reusable" bags. For me, I've got a bit of everything but think every woman should own at least one Chico bag and keep it in her purse - for those times when, well, shoot, she forgot her bags. And that, is this week's Superheroes' Secrets. Some great links here. Loved the last bit in the article by Barbara Damrosch (the link about the movement against gardening) about plants being determined to grow, even without chemicals. Today I'm going to the local feed and seed to see if I can find some potting soil ingredients. 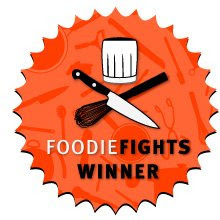 Foodie Fights was interesting. My advice - do not go there when you are hungry! Everything looked so good by the time I left the site I wanted to eat everything in my cupboard. Wonderful post. Thanks for all the links!! Deb G: I loved that quote too!! Hope the potting soil works out for you. Sheeep: Isn't that the truth! It is a bit inspiring, though, no? There are actually studies that show the methane released by grass fed cows is absorbed mostly by the very pastures they are raised on, if properly managed. It is a self-contained system, providing fertilizer, food & carbon sequestration all in one! Many operations are not properly managed, which is why eating locally from a farmer you know is so important!